Lord Of Tears is gathering steam. One particularly exciting development is that the movie has been accepted into the San Diego Comic Fest for a screening in October. Even better news: you can pre-order your copy here and see it months before that. You want to be on the bleeding edge of the new hotness, right? 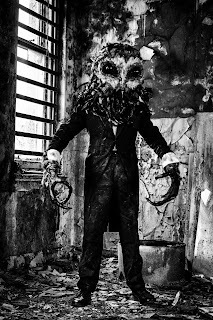 Director Lawrie Brewster was kind enough to provide the Dog Farm with some fantastic pics of the movie's creepy Owl Man taken at a Victorian Children's Hospital. If you really like that iconic Owl Man costume - and you know you do - it could be yours for a price. Check out the details at the link for pre-orders above. The trailer has garnered praise from some genre heavy hitters, as well. Much to my delight, a quote from the humble Dog Farm has somehow been posted on the Lord Of Tears Kickstarter page above a quote from Barbara (Re-Animator, From Beyond) Crampton. How can I not support a project that's done me the solid of putting me on top of the lovely Ms. Crampton? Cheers, Mr. Brewster.